Figuring out how to open the cooker was easy. I had no trouble turning the lid and plugging this unit in. The cooker pot inside comes out very easily and is washable in the dishwasher. I decided to just wash mine by hand, only because I want to be extra gentle with it. 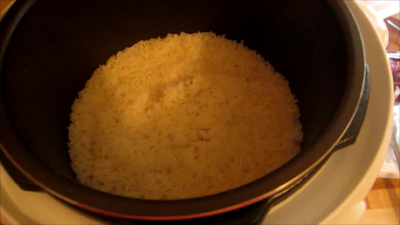 I immediately washed and dried it, ready to cook some rice for our dinner. The thickness of the pot is impressive, it is heavy duty. I followed the rice making instructions in the manual that comes with the cooker. The directions were simple and all I had to do was push the rice button, seal it up and walk away! No fear of it burning on the stove and the result was perfection. Look at the rice below, it was the most perfectly cooked rice I've ever made. I made jasmine rice and the scent of it filled the house. Next up I decided to try out the slow cooker setting. I cooked some frozen meatballs with sauce and cheese plus a big splash of water. The meatballs were tender and moist. The slow cooker did an amazing job and the pot was much easier to clean in comparison to my actual crock pot. These were perfect over some vegetable spaghetti noodles. It felt so nice to be able to set the cooker and walk away. Next time I will skip the cheese until they are done cooking though. The cheese sort of separated too much but they still tasted great! Next time I used it was for chicken. I needed cooked chicken for a recipe but I was short on time and had my chicken breasts were still frozen. All I had to do was add a few cups of liquid (I chose broth) and then float the breasts in it. I closed the cooker and set it to pressure cook (valve shut) on high for 20 minutes. I was able to finish preparing the casserole I had planned to make and even load the dishwasher while my chicken cooked. I loved opening it up to find my gorgeous breasts cooked to perfection. This cooker is a time saver for me and it helps me to be able to prepare a lovely dinner for my family of five without sweating over an oven. I am excited to try the steam setting for some vegetables next time I use it. I actually get really happy everytime I can find a way to use my cooker, it's my little kitchen buddy. It looks so nice sitting on my counter or appliance shelf and the small size makes it easy to store. Nesco is much more than just this amazing 4-in-1 pressure cooker!